Felt Art is versatile! 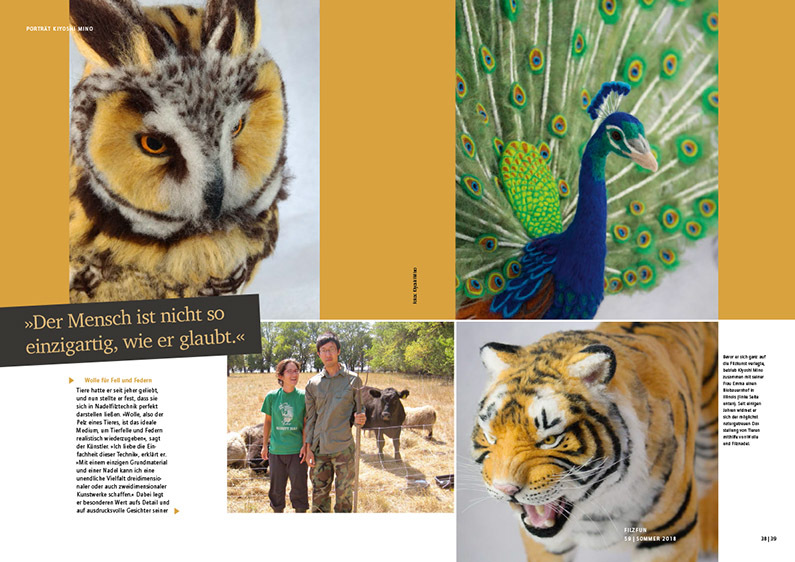 Many possible facets are shown for example during the members‘ exhibit of the Filz-Netzwerk in the filzfun summer issue. 36 artists have interpreted the motto »Gehalten & getragen (Carried & Worn)« most differently and individually. 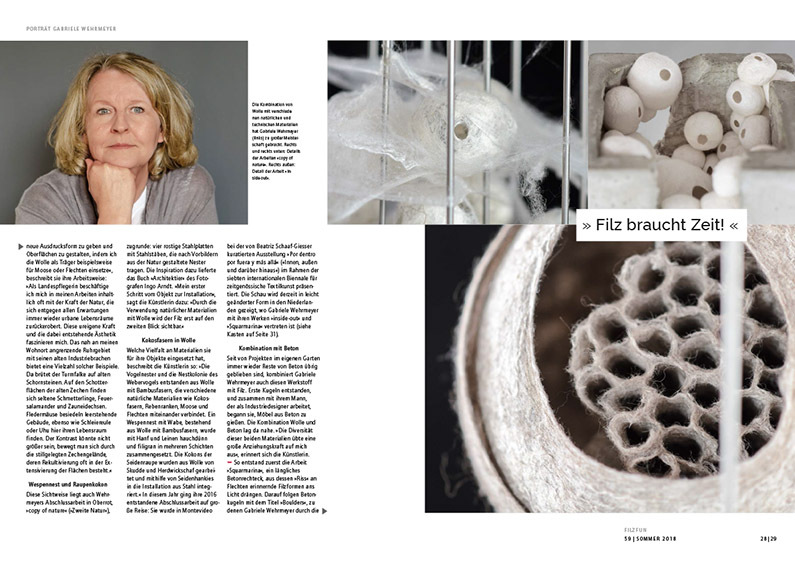 One of them is Gabriele Wehrmeyer, who masterly combines wool not only with natural but also with contrasting industrially-made materials like steel or concrete. Her works have been successfully shown in Uruguay and in the Netherlands. In a detailed portrait the regional conservationist and felt artists tells us about her love for nature and her creative work. Gabi Bauer combines textile art and the felting craft: In her studio in Oettingen, Bavaria she manufactures high-quality felt slippers, cushions and other objects for daily use. She also is well-known for her artistic actions and event. 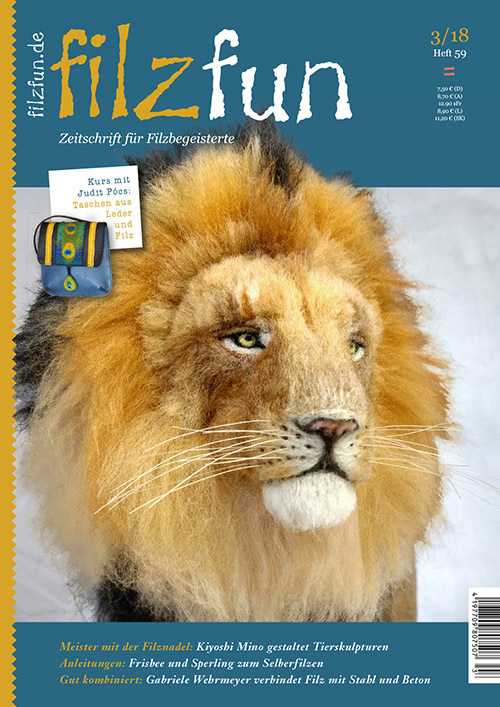 The lion that is serenely looking from the cover of the filzfun summer issue is a sculpture made by Kiyoshi Mino, an American master of needle-felting who is internationally sought-after as a teacher and instructor. 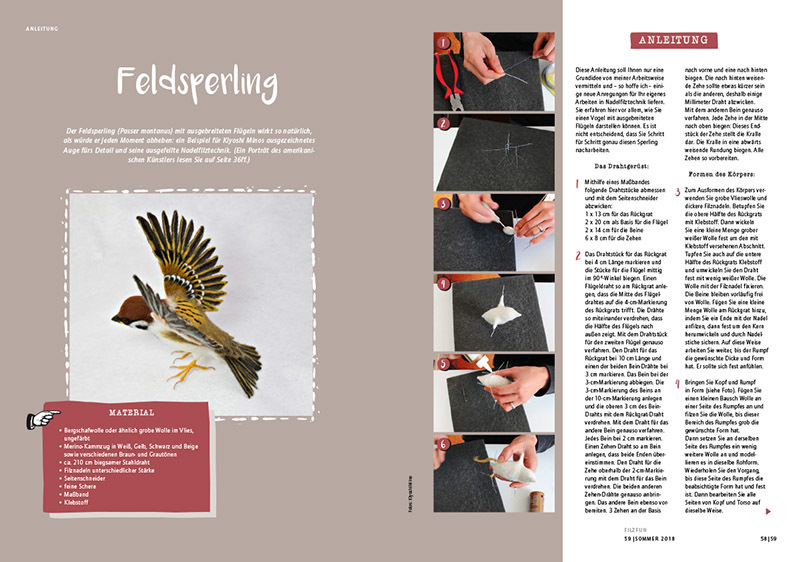 In a portrait he tells us about his artistic development and reveals some of his tricks in a detailed step-for-step instructions for the making of a true-to-life sparrow. 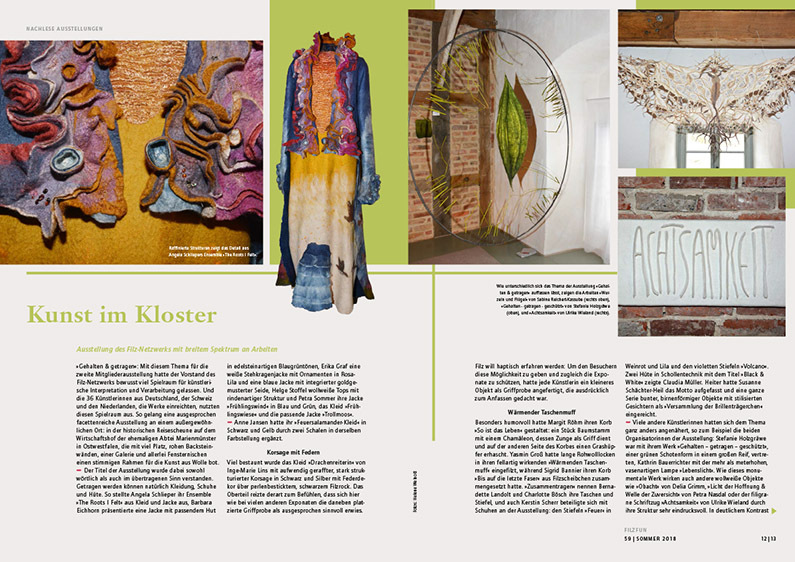 One of the pioneers of the European felting scene is Mari Nagy from Hungary, who decisively contributed to the re-discovery of the felting craft over the last decades together with her lifelong partner István Vidák. At the occasion of her 70th birthday we look back on her life dedicated to felt. 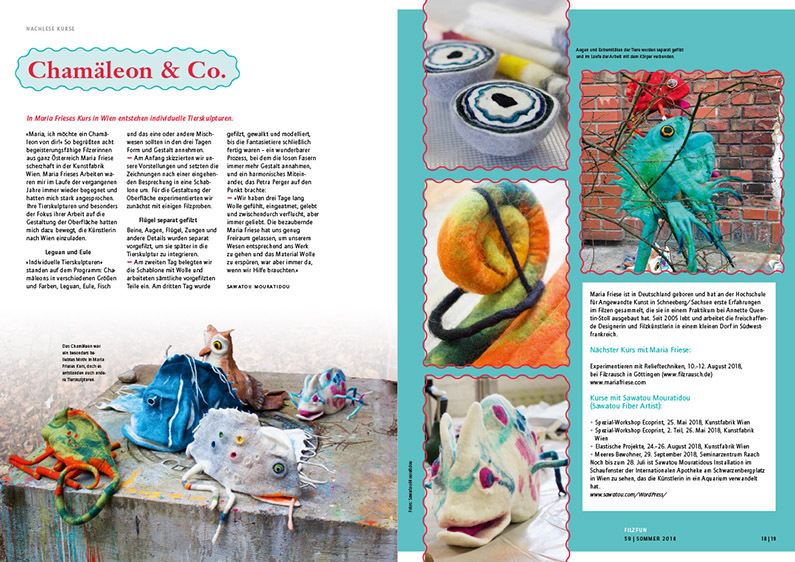 Judit Pócs, about whose bag course we are pleased to report in this issue. For some years now the profession as textile designer in the crafts, branch of study felting, has been officially recognized as an apprenticeship profession. 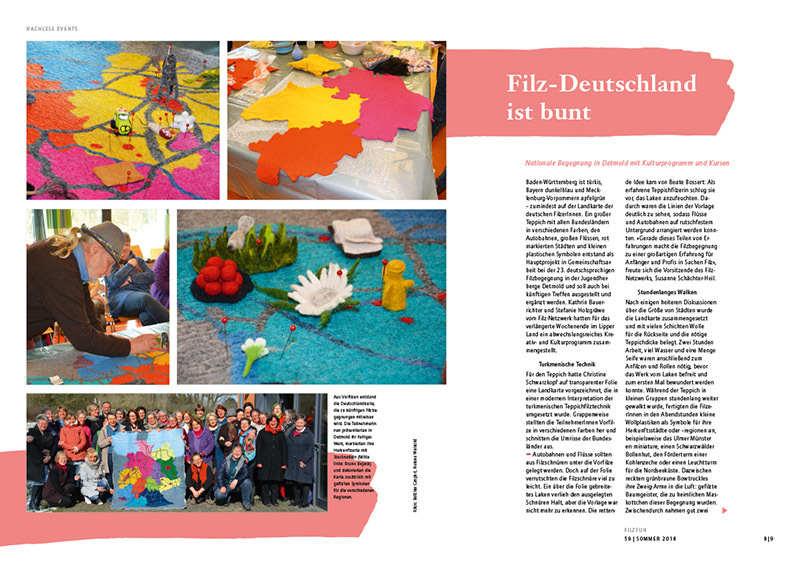 A study group of the Filz-Netzwerk is committed to promote this form of dual education. Bruno Bujack informs about the professional profile and its development. One of the first felting craftswomen who underwent this apprenticeship is Susanne Breuling. As a journeywoman’s piece she felted a game carpet. For the filzfun-readers she shares an instruction for a wool frisbee. It flies just as well as its plastic relatives but is much more sustainable! In the schedule attachment of the filzfun summer issue you find approx. 200 course offers and dates for markets, exhibitions and textile art journeys.